It’s the last week of the Tour de Fleece this week and I have saved some luxury fibres for the final sprint. 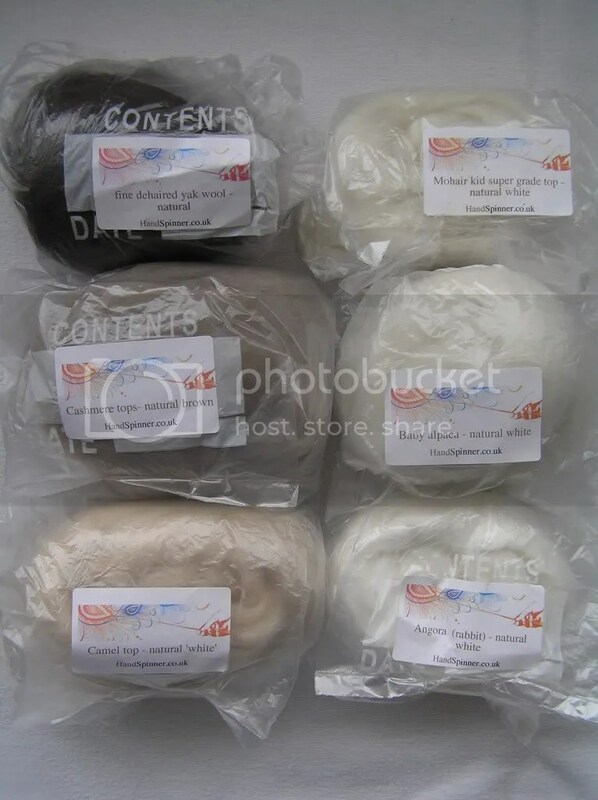 Shiela from handspinner.co.uk made a ridiculously generous offer in a recent newsletter – she was sending out sample packs, containing a selection of the luxury fibres she stocks in her shop, completely free of charge! I think it was rather a popular offer, and when mine arrived I was delighted (but I also felt rather sorry for Shiela, who must have spent hours and hours doing nothing but stuff fibre into little bags and label them). In the pack there is around 20 to 25 g of each fibre – white baby alpaca, white angora, white kid mohair, cream camel, coffee coloured cashmere and darker brown yak. I thought I’d start with the yak. It was so soft and fluffy! However, Mr Yak and I had a bit of a dispute about forming a yarn that didn’t fall apart. We agreed to have some time away from each other and review things in a few days. If he hasn’t come round to my way of thinking by them, he might have to have a trip through the carder and blend with something else! The baby alpaca is far more amenable, and is slipping smoothly through my fingers, truly a luxury fibre. I have a vague plan about creating a luxury scarf, perhaps a striped feather and fan pattern?